The Epoch Times film critic picks five films, next on the big screen in August, that appear to have potential. The hit 1960s television show was about a Cold War-era criminal organization called T.H.R.U.S.H. that tried to stir up trouble between the United States and the Soviet Union. The movie version’s new bad guys may be from Germany—that Germany—and up to no good. Which means CIA agent Napoleon Solo (Henry Cavill, “Man of Steel”) and KGB agent Illya Kuryakin (Armie Hammer, “The Lone Ranger”) still have to learn to play nice and cooperate to take down the bad guys. Directed by “Sherlock Holmes” franchise director, former husband of Madonna, and premier director who understands how competitive, alpha guys act around each other. Which is why his name is Guy Ritchie. In 1980s Compton, California, a group of musicians form the trailblazing hip-hop and gangsta-rap group N.W.A. This biopic tells the story of their formation and journey to becoming one of the founding groups of this genre. O’Shea Jackson (aka Ice Cube) is portrayed by his real-life son, O’Shea Jackson Jr.; and the director is F. Gary Gray, who directed junior’s dad, Ice Cube himself, 20 years ago in “Friday.” Oscar-nominee Paul Giamatti, who played Howard Stern’s boss in “Private Parts,” plays N.W.A. manager. They gave “an explosive voice to a silenced generation” says the official film synopsis, which refers, among other things, to N.W.A.’s stance on police brutality (Rodney King). So there’s this stoner dude, see, except he’s really a government operative—he’s a “sleeper.” His mind’s been messed with. But he’s got secret agent skills. So then the government decides that, oops, they don’t want him around anymore—he’s gotta be terminated! But whoa, hold on there government black-ops dudes, who are coming after him like it’s a walk in the park; you may find stoner boy’s a little too well-trained, for you to think you can just take him out, and then go for coffee. He’s also too stoned, into the bargain, to be predictable. This sounds like a very fun concept. Cole (Zac Efon) is a 23-year-old DJ, trying to make his mark in the electronic dance music scene. He’s got dreams, wants to become a big-time record producer. An older, more experienced DJ, James (Wes Bentley) starts mentoring Cole. However, Cole finds he’s got a thing for James’s woman, Sophie (former model Emily Ratajkowski). That all naturally gets out of control, with James naturally being very unhappy with this development. Therefore, Cole’s got to rethink his game plan. Maybe his whole life plan. A woman lives alone on a farm in a post-nuclear apocalyptic valley, which has somehow managed to avoid radiation poisoning. 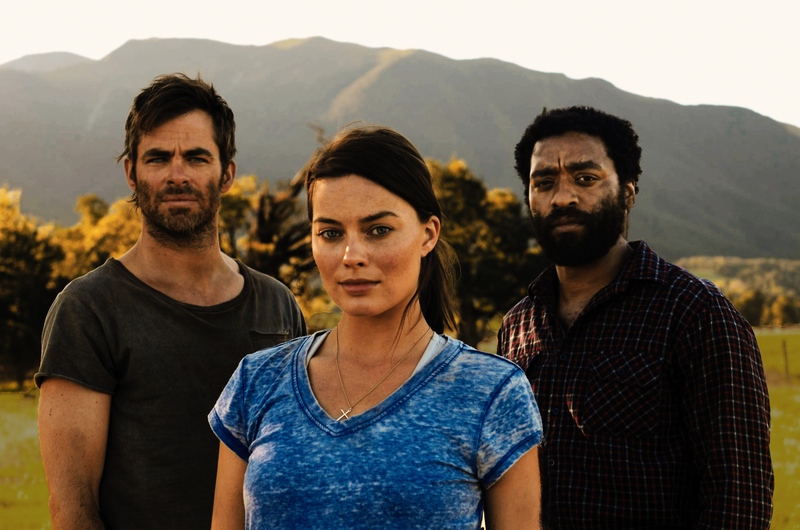 A year after the war, a stranger shows up (Chiwetel Ejiofor). He moves in; but it turns out—he’s got radiation sickness. They connect, they make plans, but then he starts to get weird and controlling. A third, (very handsome) survivor shows up. What could possibly go wrong?